Looking for a New Audi RS 3 in your area? 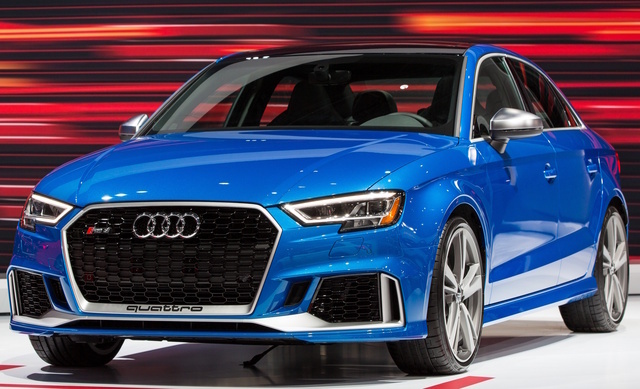 CarGurus has 308 nationwide Audi RS 3 dealers with 26 new car listings. The 2019 Audi RS3, a jaunty 4-door that competes with the BMW M2 and the Mercedes-Benz AMG CLA 45, gets a few updates for 2019. The RS3 comes in just one trim. It’s powered by a turbocharged 2.5-liter 5-cylinder engine, introduced last year. It produces 394 horsepower and 354 pound-feet of torque and it's mated to 7-speed dual-clutch automatic transmission (DCT) with Audi’s quattro all-wheel drive (AWD). That setup pushes the RS3 from 0-60 mph in 3.9 seconds with a top track speed of 155 mph, although that can be increased to 174 mph with the Dynamic Plus package. As of this writing, fuel economy numbers aren’t yet available. The suspension and brakes have been upgraded to match the increase in power. The Dynamic Plus package offers a fixed sport suspension that makes the RS3 feel even more like a race car. It also adds 8-piston front ceramic brakes that take 8 pounds off the car’s weight and help reduce brake fade. Nineteen-inch tires come standard. You can modify the car’s handling to suit your tastes with Audi’s Drive select, which offers four modes–Comfort, Auto, Dynamic and Individual–that adjust the steering, throttle response, shift points, and damper control. There’s also an available Sport mode if you want to push the RS3 even harder. Inside, the illuminated door sills and Nappa leather sports seats include RS badging and embossing. The RS logo is also on the paddle shifters, which are attached to a 3-spoke, flat-bottom sport steering wheel. Other interior features include dual-zone climate control, illuminated aluminum race inlays, heated front seats with 4-way lumbar adjust, a panoramic sunroof, an auto-dimming rearview mirror with digital compass, and stainless steel pedal caps. There’s plenty of tech in this sporty sedan. Bluetooth, Apple CarPlay and Android Auto, keyless start and stop, automatic wipers, and a 10-speaker sound system with HD Radio come standard. Notable options include Audi's virtual cockpit, which includes a customizable 12.3-inch digital display with navigation, and a 14-speaker, 705-watt Bang & Olufsen sound system. Standard safety features include Audi’s driver-assist technology that detects other vehicles and warns the driver if it senses an imminent collision. 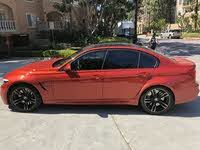 Other safety features include electronic stability control with secondary-collision brake assist and traction control, an anti-theft alarm system with immobilizer, a tire-pressure monitor, and a power central-locking system with a safety unlock feature if airbags deploy. What's your take on the 2019 Audi RS 3? Have you driven a 2019 Audi RS 3? Enter your zip to see incentives for a new RS 3 in your area. Looking for a Used RS 3 in your area? CarGurus has 32 nationwide RS 3 listings starting at $53,000.